The leveling is handled a bit differently between Elder Scrolls Online and Elder Scrolls. In a normal Elder Scrolls game, you level up based on the number of skill increases. 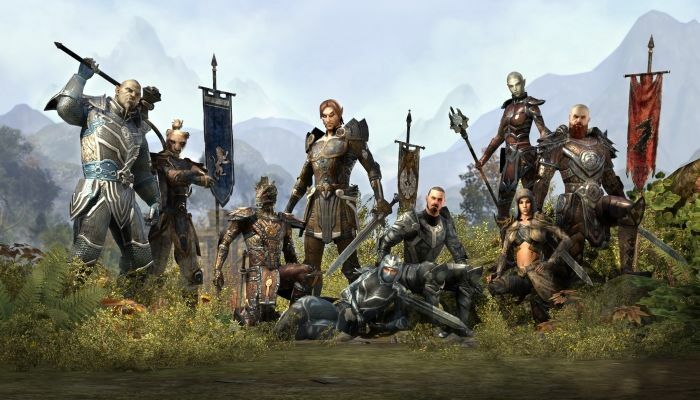 In ESO, the leveling system operates more like a traditional MMO. Your level is determined by the total amount of experience points. While it may seem obvious, quests are one of the easiest ways to level up your character. Many quests will have you killing various enemies, then reporting back to the NPC who issued the quest. You get experience points for every monster you kill during the quest, as well as the bonus experience points gained by completing the quest. In addition to the generic quests issued by NPCs, there are also guild quests. The advantage of guild quests is that they aren't one-off quests like the ones the general NPCs issue. Guild quests have a specific path you must follow, with each subsequent quest generally offering more and more experience points. Leveling up your skills is important to increasing your overall experience points. As you might expect, the best way to level up your skills is by using those skills. Some races have experience point bonuses for specific skills. While appearance is always important, if you're looking to level up as quickly as possible, take this into account when creating your character. Select a race that has skill point bonuses to match your general play style. While you may not know which skills you prefer at the beginning of the game, it's best to test out each skill on an easy enemy. Don't continue to level up a skill that isn't helpful in battle. If you think a skill looks helpful, test it out before you put a lot of time and effort into leveling it up. Skyshards are also a great way to gain skill points. These items are new to the Elder Scrolls universe, but are fairly easy to spot. If you see an object shining in the distance, chances are it's a Skyshard. They also make a ringing noise as you approach them. There are over 300 Skyshards in ESO, and they can be picked up by multiple players. Don't worry if you see another player standing at a Skyshard. You can still pick it up and use it to gain an extra skill point. Once you've earned enough experience points to reach level 10, you can start participating in faction wars. These are large-scale battles that incorporate a huge number of players. The more actions you take during a faction war battle (healing, inflicting damage, etc. ), the more experience points you'll be rewarded with at the conclusion of the fight. It generally doesn't take much effort to receive a good deal of experience points in faction battles, which makes them a great source for quickly leveling up. You don't have to limit your interactions with other players to faction wars. If you see another player fighting an enemy, you can help them out to earn experience points. The more you help, the more experience points you'll gain when the enemy is defeated. You can also join a party and take on a dungeon to earn even more experience points and some quality loot as well. In addition, you can craft to level yourself up as well. At first, focus on one or two crafting skills and level them up by attempting various crafts. Not only will you level yourself up in the process, you'll be creating items you can sell to make money. As with any MMO, there will be some down time while you wait for party members or various events to begin. Use this down time to craft so you're always gaining experience points. All these tips we post above are good ways to level your character up. You may need cheap ESO Gold to go further level in game. now eso-gold.com provide gamers cheap and safe ESO Gold for sale.